Mumbai: Direct transfer of cooking gas subsidies, which made a chaotic debut two years ago, has finally stabilised, serving its purpose of weeding out spurious customers and saving the government more than ₹ Rs.10,000 crore in 2014-15. Official data show that cooking gas consumption during the January-June period grew at a slower 7.82%, nearly four percentage points less than 11.4% growth in the same period last year. Under the original policy for subsidizing liquified petroleum gas (LPG), customers bought subsidised gas cylinders from retailers, and the government compensated companies for their losses. Under the direct benefit transfer for liquified petroleum gas (DBTL) introduced in 2013, customers had to buy at the full price, and the subsidy would be directly credited to their bank accounts, by linking it with their Aadhaar numbers. This scheme, however, did not take off, and was modified later as PAHAL by the new government that took power in May 2014. Under this, subsidies would be credited even if the customer did not have an Aadhaar number. The slowing growth in subsidised gas sales was also accompanied by an increase in consumption of cylinders sold at market price. Demand for such cylinders grew 30.82% during the same period, against a fall in demand in the same period in the previous year, according to Petroleum Planning and Analysis Cell (PPAC), a statistical body under the ministry of petroleum and natural gas (MoPNG). The success of the modified scheme helped fuel marketing companies save almost ₹ 8,000 crore in the last six months, said company officials after the scheme closed on 30 June. “We estimate that in 2014-15, savings could be as much ₹ 12,700 crore, which is a lot of money," chief economic advisor (CEA) Arvind Subramanian said at a conference in New Delhi on Thursday. “But savings will be lower this year at around ₹ 6,500 crore." Subramanian, however, said that the government should make sure genuine beneficiaries are not excluded. “It’s necessary that we don’t overestimate the gain and under-recognise possible cost of doing this and in the case of DBT and PAHAL, we have some preliminary evidence to suggest that a lot of it is elimination of ghost beneficiaries, but we can’t rule out that there could be exclusion of genuine beneficiaries," he said. Subramanian added that because of schemes such as PAHAL, Jan Dhan Yojana and Aadhaar, institutional arrangements have improved and “things are now working". However, India’s three state-owned oil marketing companies (OMCs) Indian Oil Corp. Ltd (IOC), Bharat Petroleum Corp. Ltd (BPCL) and Hindustan Petroleum Corp. Ltd (HPCL) which dominate the cooking gas market, are not complacent. S. Varadarajan, chairman and managing director, BPCL, said on 25 June that it’s time now to take the scheme to rural India. “This will not only help the companies in extending the benefits of the DBTL scheme to those who do not have access to cylinders, but will also help us to reach a growth rate of close to 9%," he said. According to George Paul, who led BPCL’s DBTL campaign as its executive director—LPG from November to March, 85% of the domestic LPG connections have been linked to DBTL, which is almost 12 crore of the total 15 crore customers. “The remaining, which has not been linked, are either dubious connections or are the ones which were used in the commercial space." Paul said BPCL saw a surge in demand for commercial cylinders in the last six months, as most of the domestic cylinders that were diverted for commercial use are now under the DBTL lens. He could not comment on BPCL’s latest DBTL plans as he is now in charge of the company’s retail division. An official from IOC, India’s biggest cooking gas supplier, agreed it was time to go rural with the subsidy scheme. “Currently, 65% of Indian households are under LPG, out of which the majority of the customers are in the urban and semi-urban areas of the country. These areas are now saturated and there is no scope for growth. The next phase of growth will come from the rural pockets of India," he said. The plan is to increase LPG penetration to almost 85% of the country in five years, he said, adding IOC will focus primarily on the eastern states such as Odisha and Bihar. A 17 June report by Edelweiss Securities Ltd praised the gas subsidy scheme. 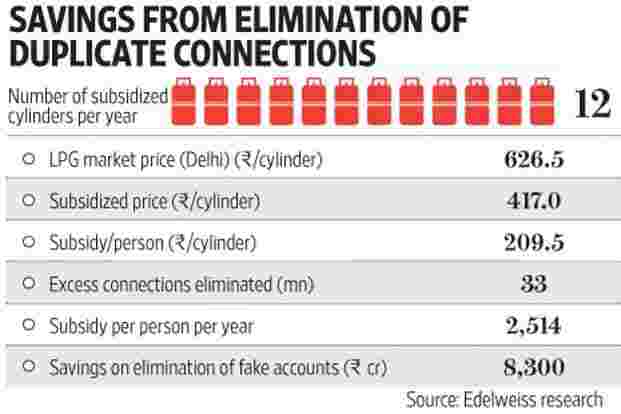 “We estimate savings under the (DBTL) scheme at ~ ₹ 83bn (~20% of FY17E subsidies) due to check on pilferages… The ongoing LPG reforms will further cut OMCs’ interest burden, improving their working capital positions," the report said. OMCs earning market prices on LPG under PAHAL could further reduce subsidies for 2016-17 by close to 15%, the report claimed. According to the PPAC data, overall loss in selling subsidised LPG in 2014-15 was ₹ 36,580 crore, against ₹ 46,458 crore a year ago. “While the rural focus will definitely help the OMCs in increasing sales and further the benefits of DBTL, what is also needed is to collect data of customers and regions to pinpoint actual consumption. This can help in bringing down the number of subsidised cylinders from 12 to nine. This will help save further costs for the government," said Pratap Doshi, president, All India LPG Distributors Association. PAHAL, which was rolled out in 54 districts from 15 November, was implemented nation-wide from 1 January.